There are a lot of professional employees out there, but not all have that personal touch that makes the workplace so great. 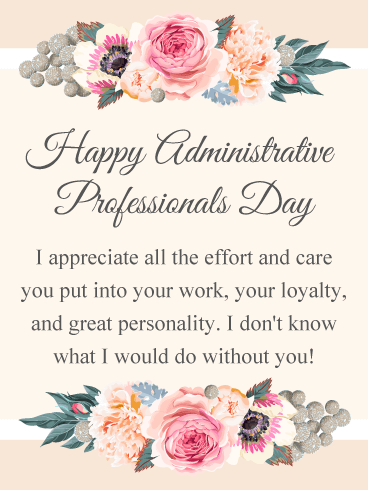 If your assistant, receptionist, or secretary has a friendly personality, along with great professionalism, then send this appreciative Happy Administrative Professionals Day card their way! 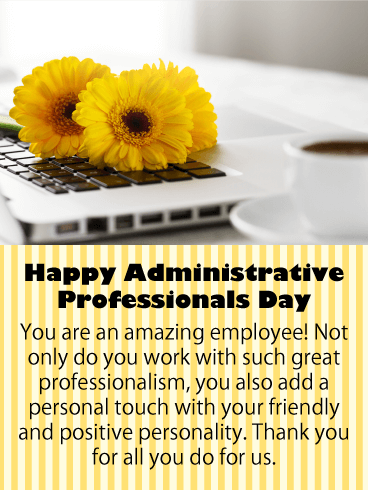 Your administrative professional will be touched that you took the time to thank them for all they do! Send these flowers their way with this Administrative Professionals Day card today! Taking meeting notes, maintaining calendars, drafting letters, whatever it is your secretary, receptionist or assistant does on a daily bases, it's worth a thank you with this great Happy Administrative Professionals Day card! This greeting card will let your administrative professional know that they are doing an excellent job and that they are an important part of the team! 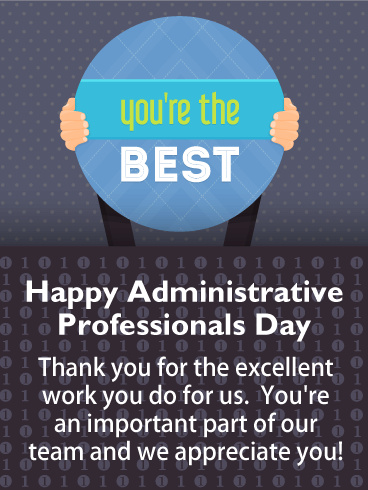 Send this Administrative Professional Day card out today to let your employee know that you think they are the best! If you feel you wouldn't know what to do without your receptionist, secretary, or assistant, then let them know with this beautiful Administrative Professionals Day card! It will show them how important they are to you. This lovely floral greeting card tells your administrative professional that you appreciate the care and effort they put into their work. An Administrative Professionals Day card will make their day, so be sure to send it out to your employee today! Dios mio, is it already the month of May? 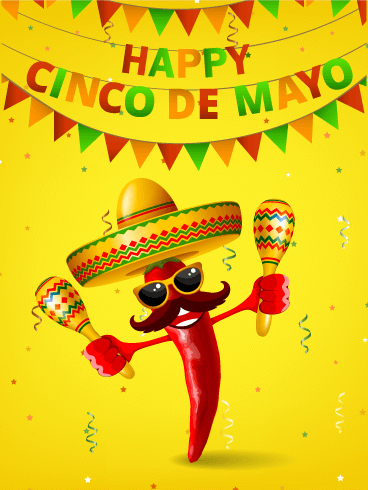 Celebrate Cinco de Mayo with this fun Cinco de Mayo card! The Mexico-inspired design will be the perfect way to celebrate this fun holiday! 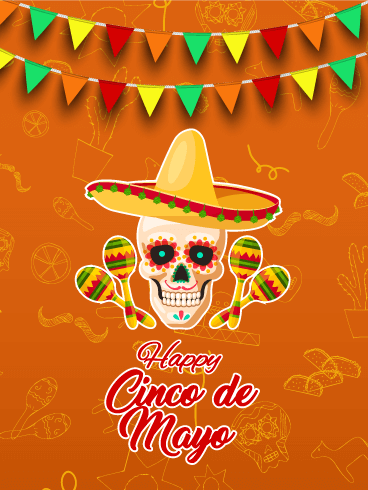 This holiday is meant for mariachi bands, tamales, sombreros, and fun - so send this colorful and decorative Cinco de Mayo card to everyone you know and love today! In Mexico, Cinco de Mayo is a commemoration of an important victory in their nation's history. 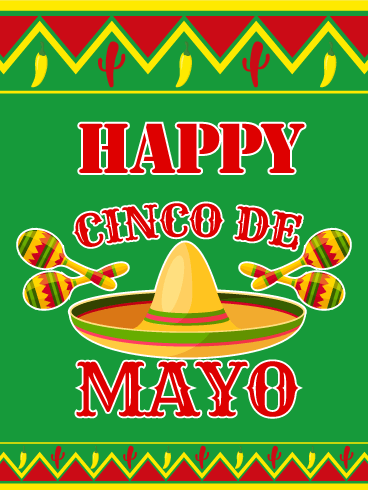 In America, Cinco de Mayo is a celebration of Mexico, its culture, and the Mexican heritage of many of our citizens. To celebrate this fun holiday this year, send this Cinco de Mayo card to your friends and family! The festive pepper and bright colors will make this the best card they've ever received! Do you have a craving for tacos, cuervo, and mariachi band music? Then you're ready for a fun and boisterous Cinco de Mayo celebration! Like St. Patrick's Day, this holiday is a chance to celebrate one of the many cultures that form our large and diverse country. 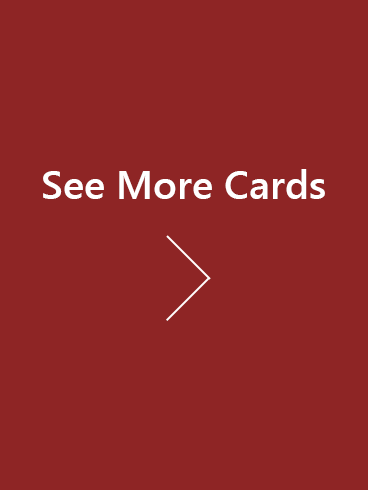 With this Cinco de Mayo card, you can make this year's celebration the best one ever! Nurses naturally have a caring personality which their patients truly appreciate. This brings a smile to the patient's face and brightens their day! Now it's time to send a smile to all the nurses you know with this cute Happy Nurses Day card! This greeting card will let him or her know that their caring ways make a difference in people's lives! 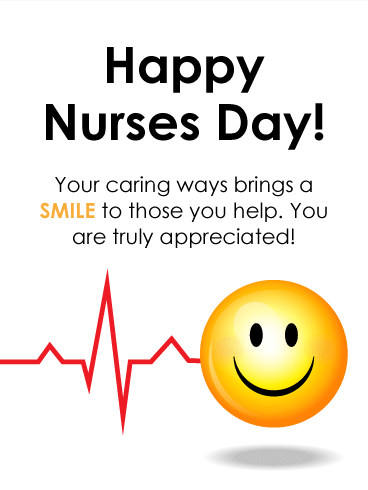 So add a smile to a nurse's day with this terrific Happy Nurses Day card! Patients need nurses who are dedicated, and this is why a nurse's role is so important. So tell all the nurses you know just how much they are needed and appreciated with this wonderful Happy Nurses Day card. It features a terrific image of a stethoscope with flowers and a heart, very fitting for a nurse! This Nurses Day card will remind them that their hours of hard work, attention to great detail, and their compassionate ways are not going unnoticed! A Nurse's dedication along with the countless things they do to care for others is truly worth special recognition! 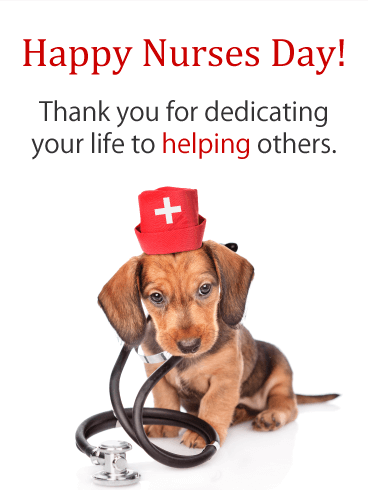 This Nurses Day card will not only thank them, it will also put a smile on their face when they see the adorable puppy wearing a nurse's hat! 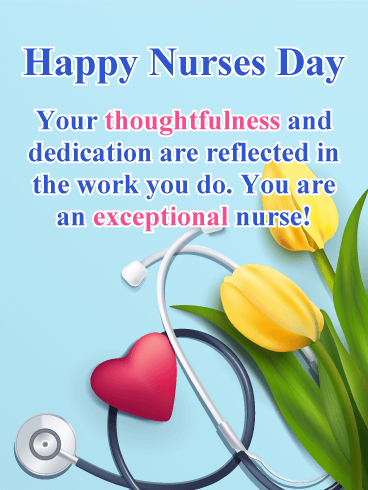 Brighten the day of the nurses you know with this thoughtful Happy Nurses Day card, it will remind them how valuable and appreciated they really are. This exquisite Mother’s Day card will be the highlight of your mother’s big day. 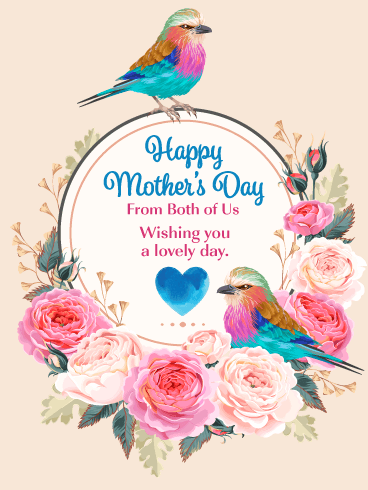 Beautiful vibrant birds, delicate pastel flowers, and a lovely heart make this greeting card one that she will always remember. Your mother will be so happy the two of you sent it her way. Make this Mother’s Day her best one yet by sending these little birds over to her soon. Fill your mother’s heart with love this year by sending her this elegant card! It’s impossible to find a woman in your life who has been as patient with you as your mother. She’s a kind soul, who is always ready with a smile and helping hand. 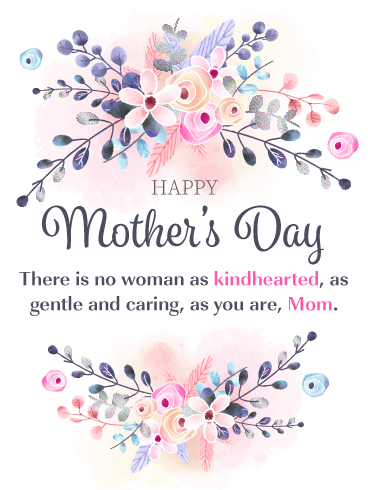 Her warm spirit has lifted your heart on your worst days and today, Mother’s Day is your chance to tell her just how much she means to you. Send her this card and watch her smile. You were best buds as children and, now that you're adults, your relationship continues to grow stronger and closer. On Brother's Day, let your brother know that you're grateful for the relationship you have. 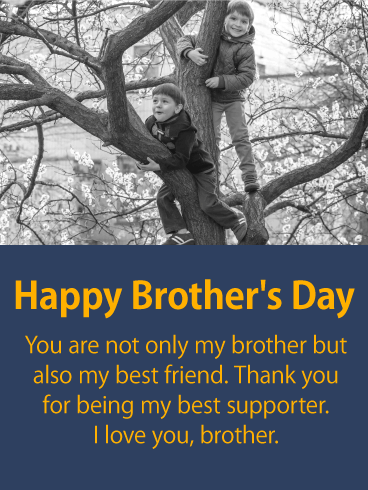 Send this Happy Brother's Day card to celebrate your brotherhood today! Your brother is and always will be the best person you have ever known. He has always been the person you look up to and the one you turn to for advice. When life gets hard, you know that he will always be there to guide and encourage you. 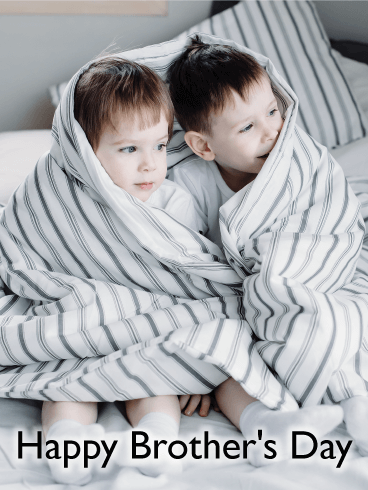 With this Happy Brother's Day card, you can thank your brother for always being there and show him how much you love him. You and your brothers have always been the best of friends. People said you were "three peas in a pod" or "The Three Musketeers." You would play together from dawn to dusk and have always been the best of friends. 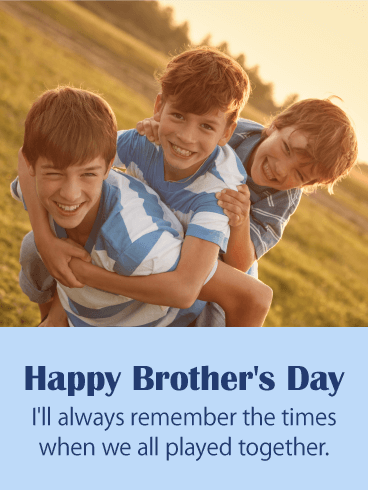 By sending this Happy Brother's Day card to your brothers, you can help them remember the fun times you have together and celebrate the memories you have built! Choose this U.S Flag Happy Memorial Day card to pass the celebratory spirit on to any important people in your life! Whatever you call it, the American Flag looks inarguably graceful subtly making its appearance on the side of this Memorial Day card. 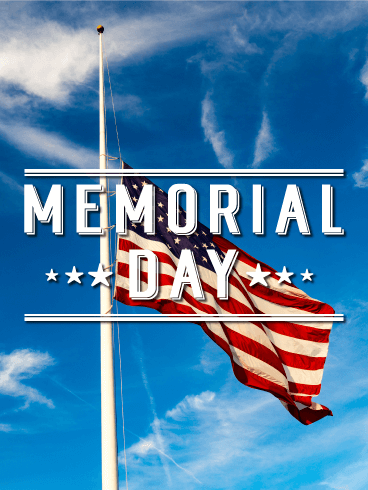 Wish the wonderful people in your life a Happy Memorial Day by sending this tasteful card that is certain to remind them to take a moment during the festivities of the day to remember those that served. 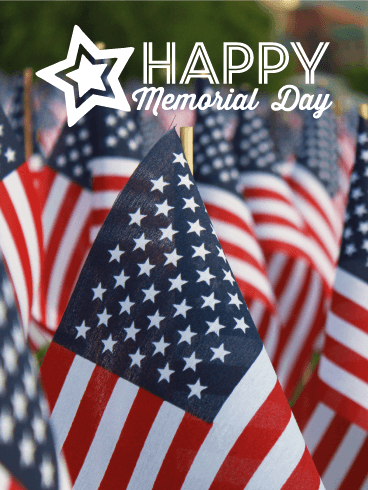 Stand as tall and proud as this army of an American Flag waving gently in the breeze this Memorial Day by passing this sunny card on to your friends! Sharing this card is a wonderful way to honor the memory of those that have served and fallen in the line of duty. Old Glory, the old Star and Stripes, the star spangled banner. Whatever you call it, the American Flag looks inarguably graceful subtly making its appearance on the side of this Memorial Day card, lying gracefully against the wood grain background. Wish the wonderful people in your life a Happy Memorial Day by sending this tasteful card that is certain to remind them to take a moment during the festivities of the day to remember those that served. Everyone has a birthday, a special day that brings celebration and excitement to everyone involved. 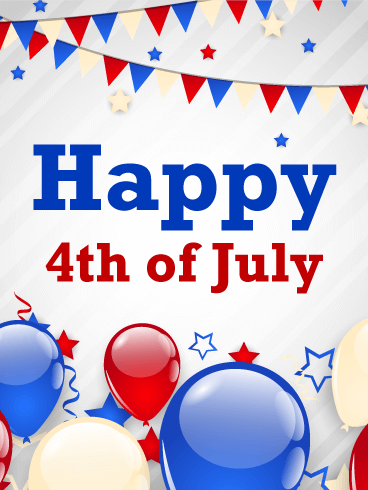 Like people, the American flag has a birthday, too! 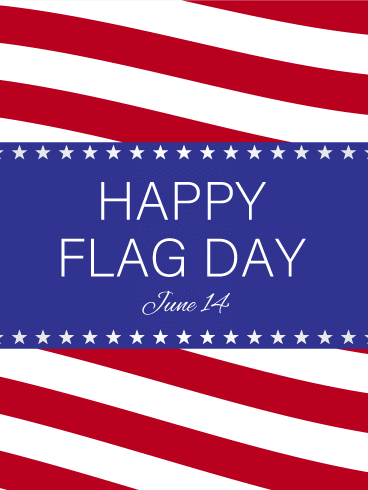 On Flag Day every year, Americans take a moment to remember what the flag means and the sacrifices that have kept it flying. 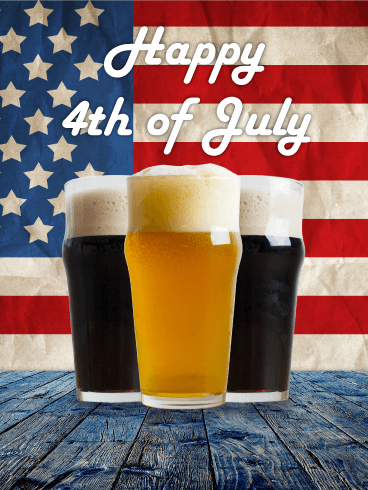 With this Happy Flag Day card, you can use this beautiful and inspiring image of the flag to celebrate our history and everything the stars and stripes represent. 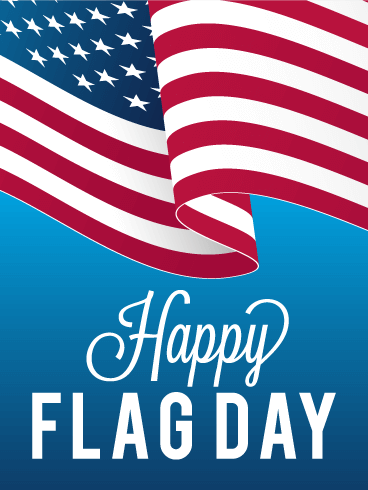 On Flag Day every year, Americans take a moment to remember what the flag means and the sacrifices that have kept it flying. 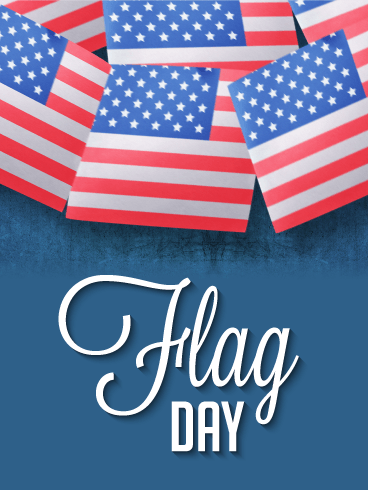 For all 242 years of America's life, the stars and stripes of her flag have represented the freedoms and sacrifices most important to the country and her people By sending this Happy Flag Day card, you can remind your loved ones of this special day! 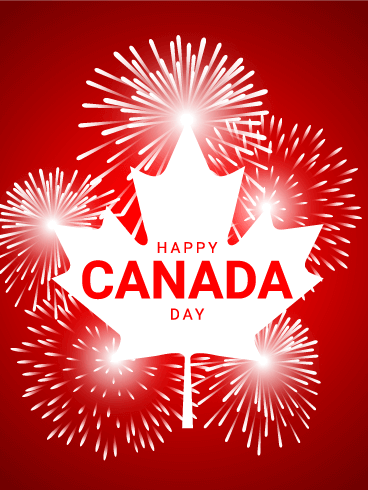 It's a grand old flag, it's a high-flying flag! 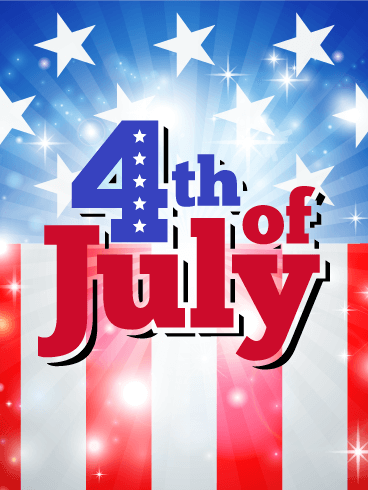 For all 242 years of America's life, the stars and stripes of her flag have represented the freedoms and sacrifices most important to the country and her people. 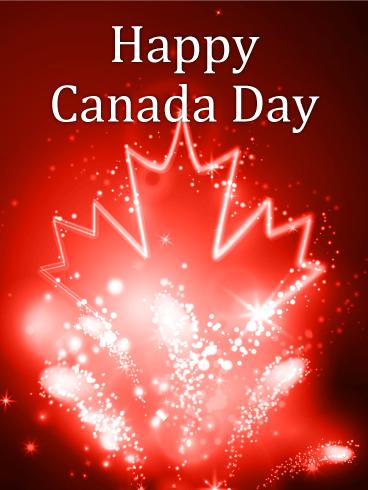 Red, white, and blue - these colors are easily recognized in the designs shown on this Happy Flag Day card. 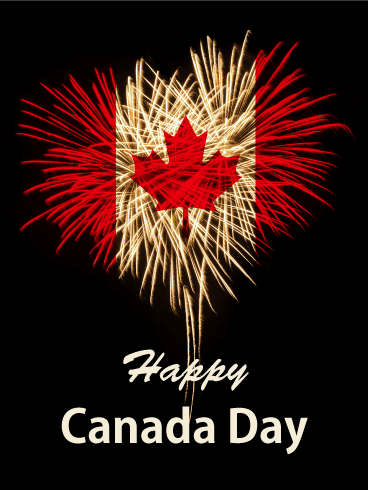 As June 14 approaches, use this card to celebrate our country, flag, and history! To a dad who’s simply the best, this Father’s Day card is a great choice! 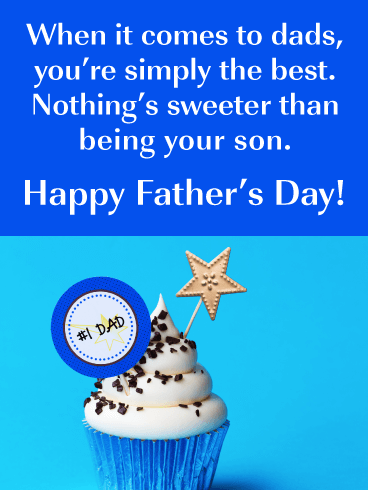 Featuring a yummy cupcake topped with a star and a ”#1 Dad” emblem, it’s heartfelt with plenty of sweetness to spare. 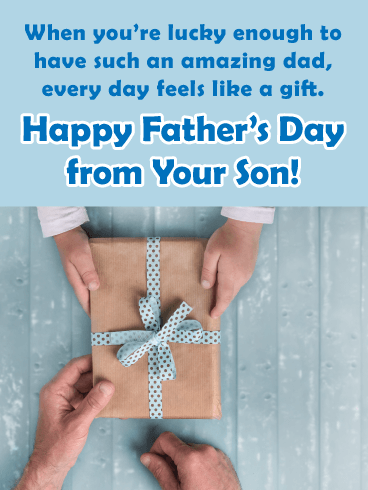 Meant for a son to send, as a way to let him know how awesome he is, this all blue greeting will make any dad feel special as he celebrates his big day. A gift from a son to his dad on Father’s Day means everything, especially when it comes from the heart. This card is a wonderful reminder that having him for a dad is a truly something special, from his kind, caring ways to all the love and support he’s shown over the years. It’s a chance to celebrate everything there is that makes him so amazing on one special day set aside just for him. Here's a Father's Day card that's all dressed up and ready to help your dad celebrate his big day in style! With plenty of color and lots of personality, this greeting features a blue & green argyle print background, which sets a fun tone for the red & white polka dot bow tie and brown derby hat in front. 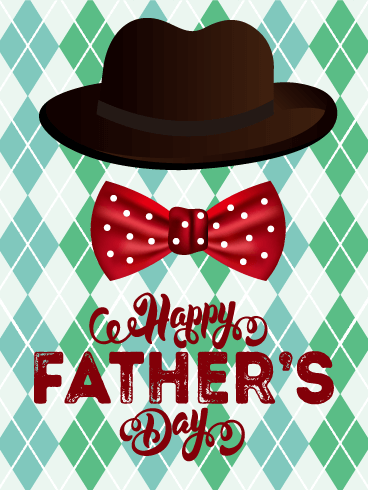 Big, bold letters below wish the man of the hour a "Happy Father's Day" from one of his biggest fans…you!